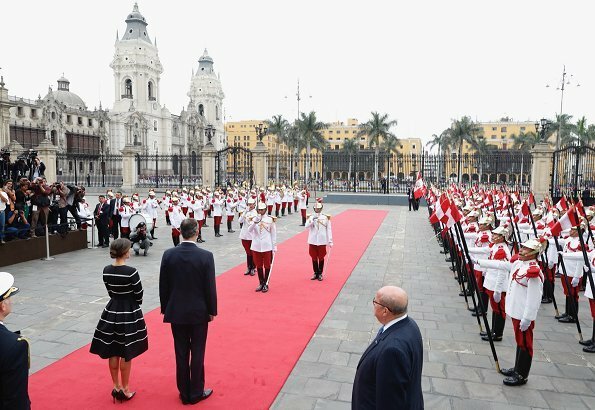 In the afternoon, the King and the Queen visited Lima City Hall and the key of the city was presented to the King with a ceremony held at the City hall. 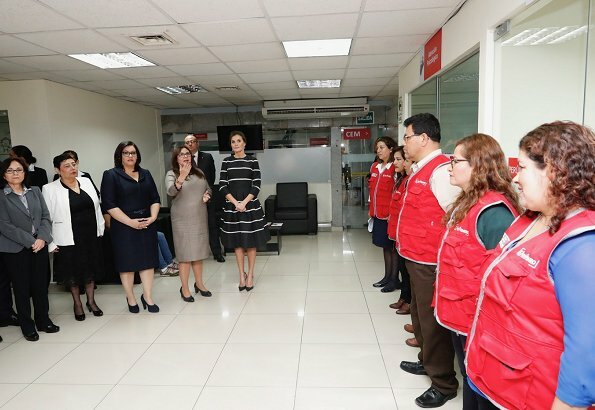 Then, Queen Letizia, along with Maribel Carmen Díaz and MInister Ana María Mendieta visited 333 Women Emergency Center (CEM). 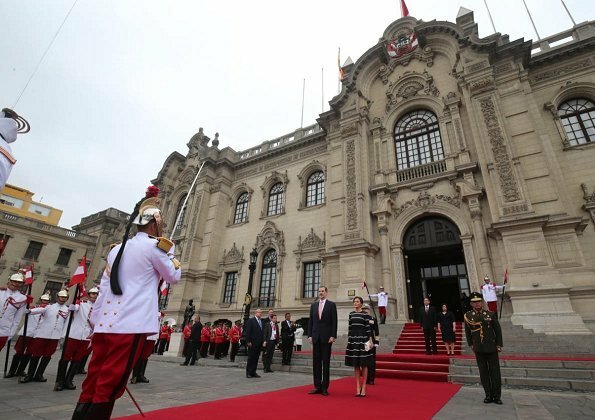 A very nice elegant dress today.A very good start to the State Visit to Peru. The princess style is not spot on for a Queen in a,state visit?? Have you read what you wrote?? I agree with Royalty fan. 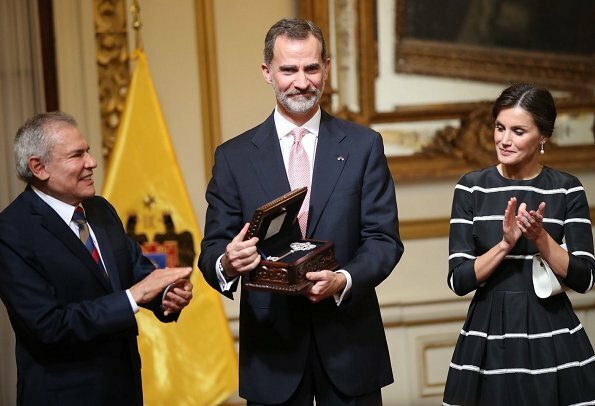 Letizia wears fantastic clothes and usually looks superb. This is not one of her better looks.. 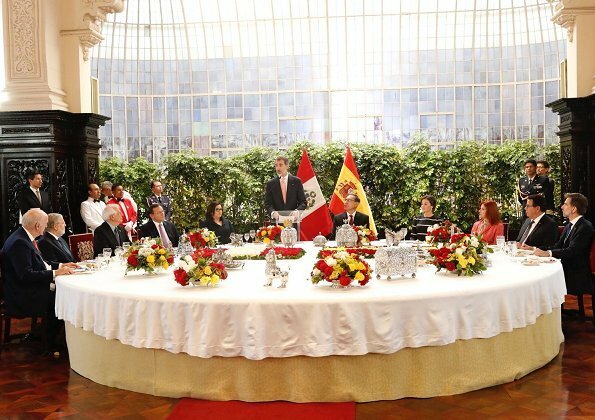 It's not a disaster but not as classy as we might have expected for the start of a state visit. I may be biased but I don't like horizontal stripes (except in a Breton t shirt) President Viscarra's wife, while smart. looks as if she is dressed for a funeral. Have you seen the typical Peruvian dress?? Obviously not.. Lo siento, AnnieM, pero no estoy de acuerdo. 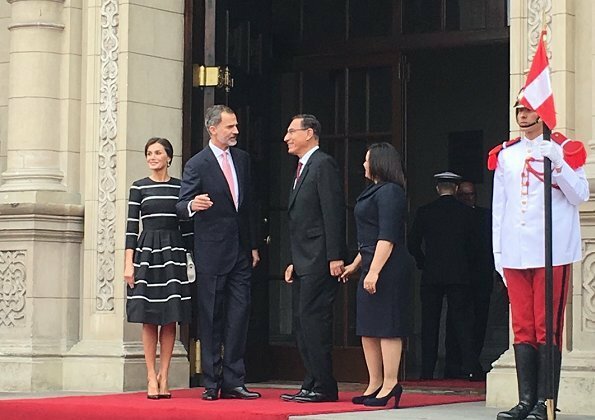 La Sra de Vizcarra lleva un vestido perfecto para una mujer pasada de peso: color oscuro, sólido, pero elegante, líneas simples y limpias, costuras verticales y un detalle festivo en el cinturón. Una mujer inteligente que se conoce bien y sabe sacar provecho de lo que tiene. La Reina está perfecta, con un magnífico vestido estilo Miss Dior para las reuniones y el almuerzo, un bonito moño y pendientes de perlas idóneos. Totalmente de acuerdo con Angie. I agree with Angie. There is a bias against black and all other dark colors. Both ladies are dressed appropriately. Very nice - I like the slightly vintage vibe and the structure of the dress. I've always been puzzled why any woman wears horizontal stripes, but at least Letizia can wear them and still look all right. The dress would be more successful if the stripes were only on the bodice, imo. Nice hair and shoes! 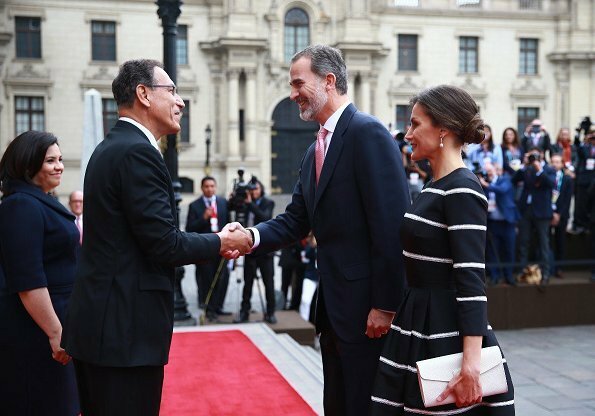 Letizia can wear that sort of dress. She looks very nice. the dress is pretty enough, but a bit childish for high level occasions like these. La reina esta muy guapa ! So you do like it or not ??? The price of the dress is only 4200 euros ! No....3400 euros. She wears CH a lot, highly lightly she obtains discounts. 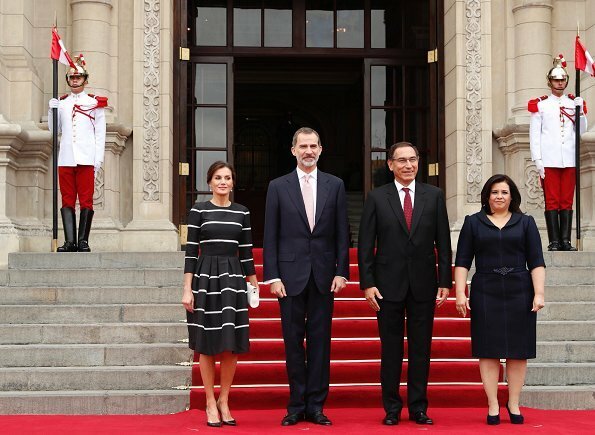 Letizia (and her miniletis) do fit and flare dresses beautifully. The color choice is specific because of the seriousness of the first event. This dress shows how a garment that is tailored to the owner fits perfectly. Whatever the fabric, it holds its shape well and did not wrinkle. 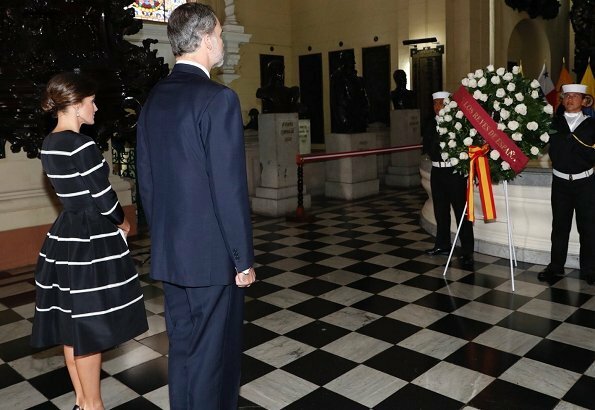 Favorite pic in this series.. the last one..Letizia totally engaged leaning forward trying to soak up all the information being given by the lady. You can feel the restrained energy. You are so right. And she is paying tribute to her host country through fashion as she does so often. She is brilliant. From the waist up great but the voluminous skirt is ok for cocktail reception not for arrival wear on a state visit. CH can be a bit froo froo. Laetizia kan zo'n rond kleed dragen, ze is zo fijn , geen rondingen. She is wearing a mimic of the typical Peruvian frock....perfect!! @11:50 you are correct. This lady's attention to detail is amazing. I think the stripes of the dress, don't match with pearl earrings. 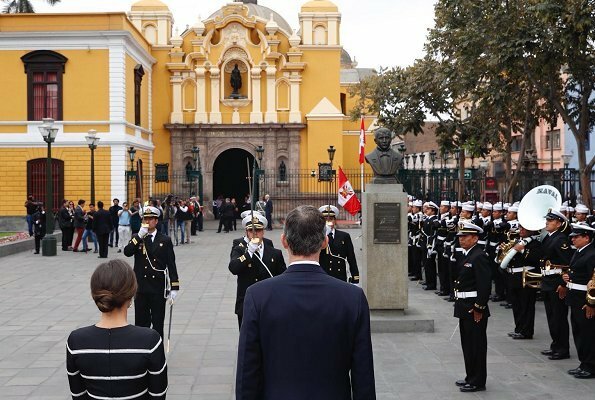 La alta sociedad peruana viste muy muy fino; las "cholas"visten ""falda ancha porque llevan muchos metros por el gran frío del altiplano""
Como la primera dama de Perú que no se esmeró mucho?? Muy fina si..
Es hablar por no estar callada, ¿verdad?. 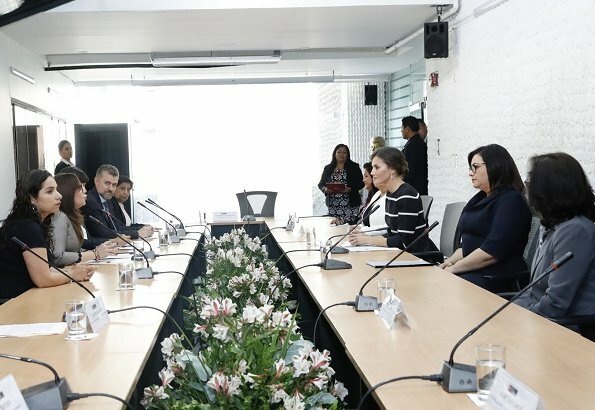 Echa un vistazo a Maribel Díaz y luego vienes a contar quién está vestida más formal. At some point in every state visit, the queen wears a garment to honor their hosts. The purse with the beetles in the UK and the Top Shop skirt, the black Armani with the Japanese motif insert in Osaka. The pleats on this skirt are as anon @11:50am states a mimic of the native Peruvian dress. It is always interesting to see how she pays tribute to the nation as a whole.